Howdy everyone! How was your Memorial Day weekend? Longer than normal, I hope. It's a funny thing about long weekends. If you're like me you have this idea that you'll be able to get a bunch of extra stuff done. But in reality, more stuff is going on, so you end up getting less done. Instead of talking about what we didn't get done, let's talk about what we did get done! This little beauty of a salad is something I did manage to get done. I can't seem to resist buying mint at the farmer's market....it smells too good. But that's OK because it forces me to find ways to use it. 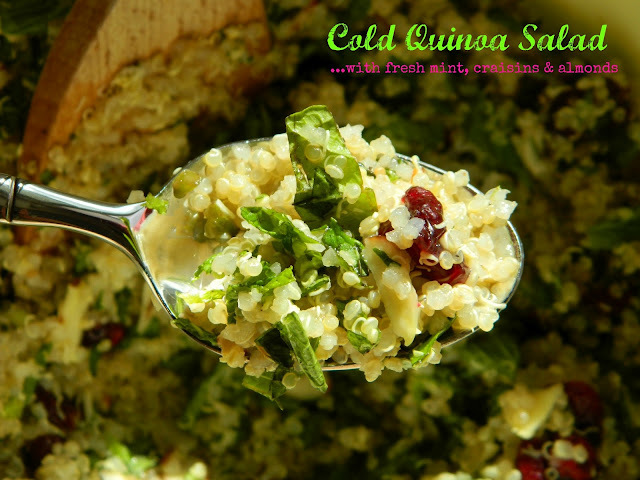 It's refreshing taste is perfect in this Cold Quinoa salad. Add a little sweetness with craisins and rice vinegar combined with hearty and protein filled quinoa and sliced almonds and you have yourself a healthy-hearty-tasty snack. Plus, it's totally easy to make. 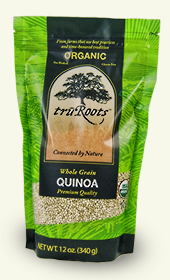 Cook quinoa in water based on the package instructions. Let it cool. To speed up the cooling process you can rinse the quinoa in cold water; you will probably lose some through the holes in your strainer, but if you're in a hurry this method works. Place quinoa in your serving bowl and add chopped mint, craisins and sliced almonds; mix. Add rice vinegar to taste. I add a couple of shakes, stir, taste and add more if I think it needs it. You can also find this at Tasty Kitchen! **I've shared this recipe on the following sites, click the links for more tasty recipe ideas! oh yum!! that looks delicious! i love nutty quinoa with sweet crasisins! delicious! and your pics are gorgeous too! thanks for sharing! Hi Ms. HappyTummy! :) Thanks for stopping by. I hope you like the salad! Besides being so good for you... quinoa is delicious and l love how you seasoned it. 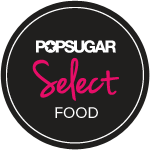 Please share this on my foodie friday party today. Hi Diane! I'm on mobile devices this week so I will share next Friday. Thanks for stopping by! Well we Irish are behind in the dried fruit naming world. I spotted this recipe and jotted it down last week. Went offline and upon reading the ingredients thought..."what in the world is a craisin!?" I'm glad you like the salad! Oops bad link. It should work to cut/paste though! this is great. I found it via the It's Keeper link up. I have linked in a beef dish. Have a super day. 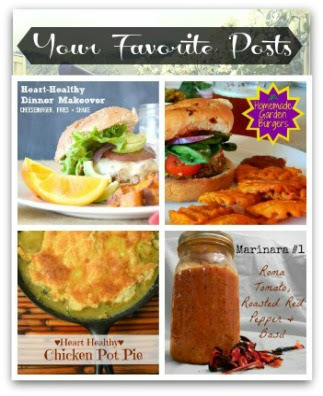 Just pinned your great recipe, thanks for sharing on Full Plate Thursday and hope you are having a great week end! What a wonderful salad. So refreshing on those hot summer nights. Mint and quinoa are my favorite combo. Love. Thanks for sharing it with us on Allergy-Free Wednesdays. Hey Amber! Thanks, have a good 4th! The subject of this week's Food on Friday is Salad. It would be great if you linked this in. This is the link . Thanks Carole, I'm all linked up! That is great. Have a lovely week. I ♥ comments! Thanks for stopping by! Recent reviews by Sarah L.
Everything posted here is mine unless otherwise indicated. Please don't steal, it's just not nice. Powered by Blogger.